convert | Hi. I'm John. 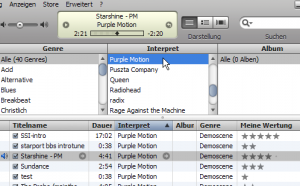 One day, Philipp Keller got fed up with installing sound libraries to listen to old-skool music files, so he decided to write a script that takes the hassle out of it and convert any mod to an mp3 file. Now you can download his script for free and use it on your own Linux box to convert your precious mod collection to mp3 for on-the-go listening. Playing your music modules as mp3 files has the added effect of allowing you to scrobble your music to Last.fm. Typically, playing anything but an mp3 causes Last.fm to disregard your tune. I know that if Last.fm or the WinAmp Audioscrobbler plugin took my mod playing seriously, I’d have a way different collection. Now I can. Open source rules. Long live music modules!